INCHEON -- World No. 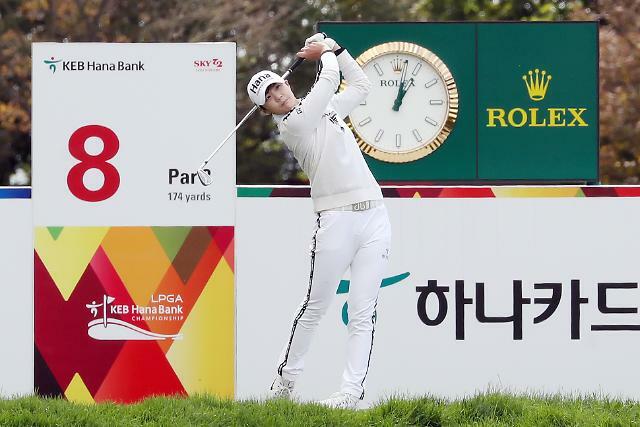 1 Park Sung-hyun grabbed a share of the second round lead at an LPGA tournament on home soil on Friday. 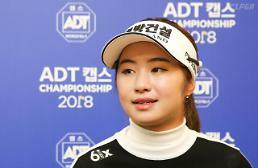 Park reached eight-under after shooting her second straight round of four-under 68 at the LPGA KEB Hana Bank Championship at Sky 72 Golf Club's Ocean Course, adjacent to Incheon International Airport. Park had six birdies against two bogeys at the par-72 course, which played at 6,251 yards Friday. Park is joined at the top by three competitors: world No. 2 Ariya Jutanugarn of Thailand, Charley Hull of England and Danielle Kang of the United States. Park finished runner-up here in 2015 and 2017. Jutanugarn poured in six birdies on her back nine en route to a 67, the low round of the day. Hull and Kang both followed their 67 from Thursday with 69 on Friday. In much warmer and gentler conditions than Thursday, Park was dialed in with her irons, but had a couple of three-putts that led to bogeys at the sixth and the 11th. "Overall, it wasn't a bad round," Park said. "I had those three-putts after setting up birdie opportunities. So those miscues stuck in my mind for a bit, but I was able to pick up a handful of birdies as well." Park said it certainly helped that the wind didn't blow as much as on the day of the first round, and when the gust picked up on a few occasions, it did so in much the same directions as her previous day. "I think my irons were much sharper today than yesterday," Park said. "I gave myself a lot of birdie chances. I am a bit disappointed that I couldn't convert all of them." Park and Jutanugarn are the only LPGA players with three victories this year. While Park leads Jutanugarn in the world rankings, the Thai star is ahead of the South Korean in the race for the Player of the Year, by 198 points to 127 points. Jutanugarn, whose roller-coaster day included three bogeys on the front nine, said she tried to keep things simple. "I didn't worry about the outcome and I wanted to just focus on the things that I can control," she said. "I didn't watch the leader board because, after my front nine, I didn't care about the lead. I just played golf."